The rebuilt orchestra and jazz programs uplift the entire school. David Byrd’s teaching style is laid-back and friendly. It's a Friday morning in April and David Byrd is blasting a Herbie Hancock and Wayne Shorter concert video through a projector onto the front wall of his high school music classroom while reviewing his lesson plan. Soon, 45 Oakland High School students will file in and take their seats, and Byrd — a Skyline graduate whose two kids also attend Oakland public schools — will patiently lead them in a day's practice. Among other things, his students are getting ready to compete at two popular springtime concert series: the California Music Educators Association's Orchestra Festival and Music in the Parks at Great America. The shows give students a chance to wow the public while vying for prizes. For these performances, Byrd's students are learning Johannes Brahms' "Hungarian Dance No. 5," a frenetically paced dance tune. The bell sounds and the students pour into the room and start tuning their violins and flutes while chatting with each other. The place is a hive of teenage energy. Byrd's teaching style is laid-back, friendly, and focused on the music. His students look excited to play together. Five years ago, this same classroom — which looks like a miniature theater and was designed for music instruction — was actually used as a holding pen during Oakland High's tardy sweeps. Busted students sat silently in chairs and absorbed a punishment of dubious value. In fact, Oakland High didn't even have an orchestra or jazz band back then. Now the space hums with strings and horns and piano chords. Byrd's little corner of the campus is a microcosm of changes taking place at Oakland High. "Five years ago, when I got here, I was shocked," said Byrd in a recent interview. "The school wasn't whole." Decades of budget problems had trimmed back Oakland High's academic programs, including music. The campus had no music teacher for years. 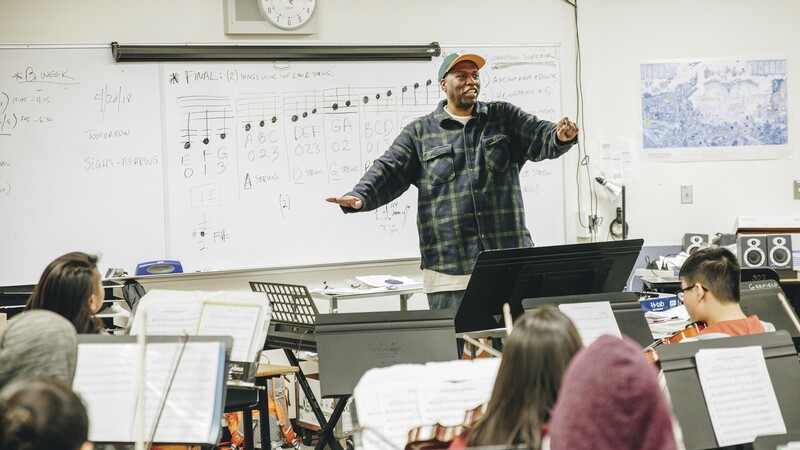 Byrd, who previously taught at Oakland Technical High School, thought music was possibly the biggest single piece missing in Oakland High's educational offerings. So along with Principal Matin Abdel-Qawi, staff, and the school's students, Byrd set about rebuilding music at OHigh. Byrd blames "Reaganomics" and other big fiscal policy changes like Proposition 13 for crushing Oakland schools. The flight of middle-class families out of the district, or to private schools, led to a massive divestment that the system never recovered from. "It was a wasteland in Oakland by 1989," he said. "They fired all the music teachers. The 1990s were like the dark ages," Byrd said about the status of dance, art, drama, and music in local schools. Then came the 2000s, state receivership, and the Great Recession. Decades later, it's been challenging to find a way to rebuild music and arts programs. Another challenge is that Oakland's students arrive on campus with a range of abilities and needs. Many of their parents are low-income and can't afford to buy an instrument. Oakland schools were among the first in the nation to offer free loaned instruments to all students, but budget problems have limited the ability of schools to provide this sort of assistance. Furthermore, some schools don't have active parent teacher associations. Oakland High's PTA just recently got back on its feet, and its ability to fundraise for instruments, or to pay for transportation to and from concerts and competitions, is less than other schools where the average parent's income is higher. Even so, Oakland High's music program is overcoming these limits and even beginning to thrive, said Byrd. Byrd comes from a musical family. His father played in Grambling State University's marching band. Byrd attended UC Berkeley and got a degree in music education from St. Mary's College. A resident of the Dimond, he walks to school each day. He said he finds it odd that many of his neighbors in the Dimond, and other nearby neighborhoods like Glenview and Trestle Glen, send their kids to private schools or bus them to Oakland Tech, when Oakland High has, in his opinion, become an excellent all-around school. According to state education data, Oakland High still struggles academically. Its students graduate at lower-than-average rates and test scores lag behind most other schools. But data also shows the school has been slowly improving. Byrd points to this year's graduating class as proof that Oakland High is rising. Fifteen seniors were accepted to UC Berkeley, 11 to UCLA, and several to Ivy League schools. One of his music students got a full scholarship to Stanford. For Oakland High, the importance of being able to offer music can't be overstated. The Oakland Unified School District has several robust middle school music programs at Edna Brewer, Roosevelt, and Westlake, among others. But for years, students have had limited options when picking which high school to attend because some don't offer music programs. Those who want to continue playing go elsewhere. Today, however, Byrd says parents and students are starting to pick Oakland High because of its reconstituted music offerings. It's helping lift the entire campus.